Effectively managing ergonomics in the office workplace is different from the approaches and methods used in other work environments like production, manufacturing, distribution, and even transportation. 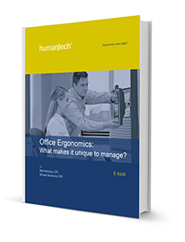 Thanks to these differences, managing office ergonomics can be fairly straightforward. This e-book was created to explain how the office culture and environment are not like the others, and to share proven best practices for keeping employees healthy and productive. Through our experience and knowledge of office ergonomics, we’ll show you how to make informed decisions on establishing or improving the ergonomics process in your organization. Through effective training, self-assessment tools, and common solutions, most people can find and fix conditions in their own workplace to improve comfort and reduce MSD risk.